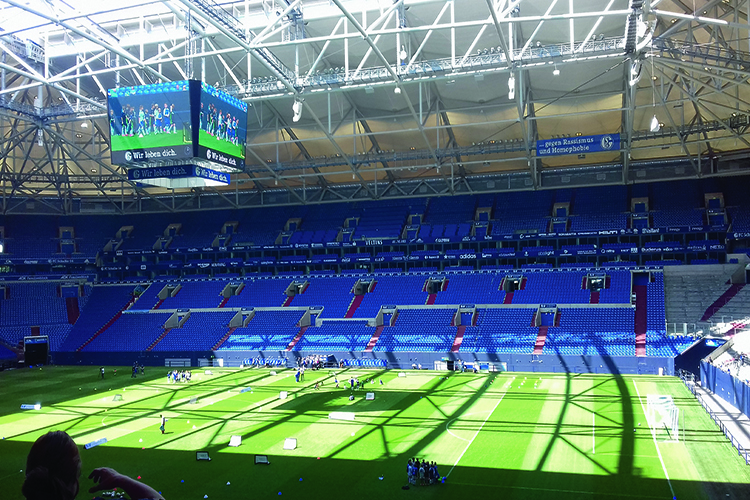 The team at VELTINS-Arena wanted to upgrade their audio system – and it was Salzbrenner Media which was tasked with delivering a solution that followed UEFA and FIFA rules and evacuation regulations, as well as being suitable for concerts. The main audio system comprises of 168 d&b audiotechnik Vi8 loudspeakers and 28 Vi-SUB subwoofers. It’s anchored in 14 different positions around the stadium, with each section – 12 Vi8 and two Vi-SUB – housed in a customised mount system that was created by Metallbau Schubert, the metal workshop on Salzbrenner Media’s grounds in Buttenheim. Each mount system was installed into the roof at VELTINS-Arena by Stage Systems. The audio system for the upper tiers includes 40 d&b audiotechnik Vi7P loudspeakers, while the system for the pitch uses 16 Vi7P loudspeakers, which are mounted in pairs. To power the audio system, there are 74 d&b audiotechnik D30 amplifiers used, while the audio network consists of two QSC Q-Sys Core 1100, 28 QSC Q-Sys I/O Frame Network Interface and 29 HP network switches. 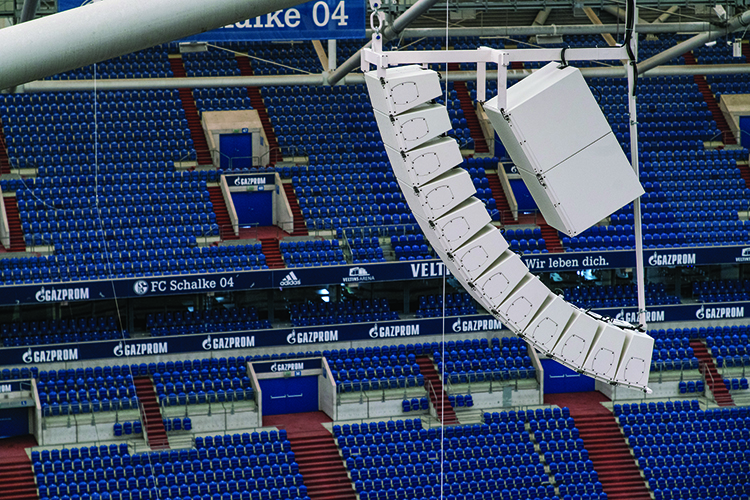 The end result has seen Salzbrenner Media deliver an audio system that is perfect for VELTINS-Arena, offering an exceptional quality of sound throughout the stadium – whether it be for match days or live concerts. It wasn’t just the audio system that was recently upgraded, though, with the stadium’s impressive, centrally-suspended LED cube also revamped, making it not only the first of its kind within football stadia, but also the largest in Europe. To help make this a reality, the main objective was to significantly improve the LED technology that was previously installed. Budget, technical parameters and the marketing content that would be on the video cube all had to be taken into consideration. Following the analysis process, the solution was to improve the image resolution by 100% – from the previous 25mm to 10mm. As well as that, the image display area would have to be doubled from 34.7 sq metres to 76.3 sq metres per each side of the cube. The structure was created using 11 tonnes of aluminium, making the total weight, with the LED displays, 30 tonnes. Using the same hanging points as the old construction, the LED cube is held up by eight steel ropes. For the actual LED displays, LEDCON UPix modules are used, with the company starting preparations and prearrangements around 18 months before installation. The total screensize – 305.28 sq metres (76.32 square metres each side) – consists of 216 LEDCON UPix modules with a pixel pitch of 10mm, giving a native resolution of 1060 x 720 pixels. The UPix LED displays are easy to maintain through its rear, horizontal service doors and reliable under the harshest of conditions, as well as being thin and lightweight. The construction time for the LED cube at VELTINS-Arena was around four weeks, with the production of the UPix modules completed in advance to make for a clear timetable in terms of construction and installation. The cube is now installed in a height of 23 metres above the field and is giving a visual experience to all the spectators and fans that have yet to be matched. The final result is nothing short of spectacular, with the LED cube dominating right in the centre of the stadium, above the pitch. The challenge was to not add to the weight of construction, despite the LED screen increasing by approximately 30%. That also needed to be completed within a time frame of around four months – that included the design, construction, structural analysis and testing, material procurement, manufacturing and on-site assembly – so, it was a difficult task. 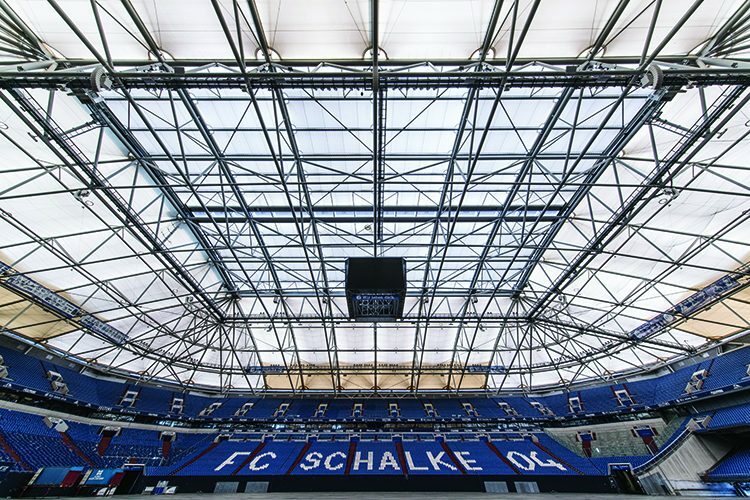 One of the most eye-catching features of VELTINS-Arena is the Teflon-coated fibreglass canvas retractable roof, which spans the entire stadium. 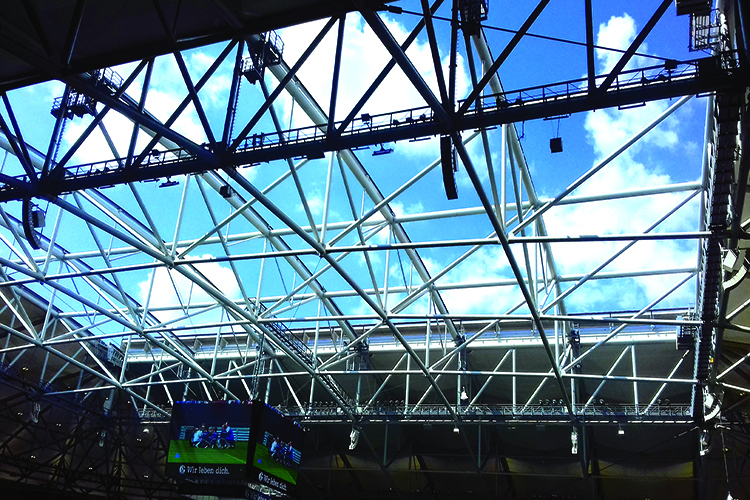 The centre of the roof can be opened into two halves, allowing for a choice between an open or covered stadium, depending on the weather or event. As well as the roof, the pitch is also retractable, delivering the ability to slide the playing field outside the stadium in just six to eight hours.